1 Anthony Davis A 1 1 91.30% While an easy choice, they get “A” for not only the best choice available, but one of the best choices going back through our 2006 calculations. His 91% is first, and 2nd is 68%. 2 Michael Kidd-Gilchrist D 4 4 61.00% NBA GMs almost always draft NCAA champs too high, and while Davis is certainly No. 1, Kidd-Gilchrist is way behind the No. 2 and No. 3 pick. Still a very strong player, but they gave away wins by going again with an NCAA title winner too early (Kemba last year). 3 Bradley Beal A 3 2 68.30% A huge drop from Davis, but stats show he should be the 2nd best player to come out of this draft, with dominance in every category that predicts NBA greatness. 4 Dion Waiters C- 8 12 54.50% Numbers not quite there, but with his phenomenal steals and very good Value Add and Usage, you can see him as a 4th pick. 5 Thomas Robinson A 2 3 68.20% We project he will be 3rd best NBA player, but in a virtual tie for 2nd as his incredible defensive rebounding. With the gap between the top 3 and the rest, he is a steal. 6 Damian Lillard D 7 19 50.60% A lot of teams liked him here, but the amount he handled the ball (too much) actually predicts AGAINST truly excelling in the NBA - but we do have him as a starter and his vertical was almost as good as DJO. If he had his numbers as a freshman this would be a good pick, but as a junior they are too low. 7 Harrison Barnes D 5 28 41.20% All of his college stats are below NBA-level, projecting a solid reserve, BUT his physical combos were unreal. So far we've found stats a better predictor than combine - but if he excels it could move the future model a little heavier on combine results. 8 Terrence Ross C- 16 14 53.50% We don't quite have him there, but the combo of rebounding, steals and an incredible vertical/speed combination make him a solid starter with upside (also hope that combo plays out for DJO). 9 Andre Drummond C 6 11 55.10% His Value Add is about average for a freshman bound for the NBA, and physicals are great - just such a weak defensive rebounder and weak on the bench press project him outside the top 10. We advised strongly against him as a top 5 or 6, but 9 is reasonable. 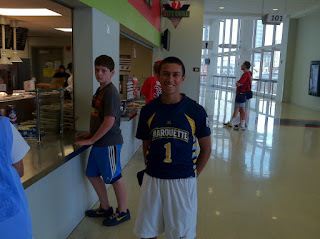 10 Austin Rivers C- 10 29 39.30% I may lose my Marquette credentials, but we really have a lot of red flags on him. But we assume Doc's lineage is more important than our stats, so best of luck. 11 Meyers Leonard A 13 8 56.90% Huge get. Drummond a little better in most things, Leonard's huge edge in the bench and defensive rebounding predict better career. 12 Jeremy Lamb C 9 17 51.80% Can't put this below a "C" because his physicals are SO good (wingspan, speed and agility) and running the model last year he looked like a top 10, so I have to attribute the dropoff to UConn's wacky year and say he is solid at 12. 13 Kendall Marshall C- 18 23 45.30% Again, it appears owners are putting high stock on vertical/speed combos. While we have him lower and outside of his incredible assists the stats aren't good, but point guards are the hardest to predict so I can only go C-. 14 John Henson A 11 6 58.70% A fantastic pick-up for the guys who share the Bradley Center. While Value Add is low for a junior who expects to play in the NBA, his defensive rebounding and reasonable usage more than offset them to point to a strong NBA starter. 15 Moe Harkless C 20 18 51.40% Very solid pick. He is better than average in 9 of the 10 biggest predictors of NBA talent - only a very poor bench dragged him down a few spots. 16 Royce White C- 21 20 50.10% Right there as a borderline NBA starter. His Value add was only 10th percentile for draftees, but other than that his overpowering rebounding and good steals for a big man make this a solid pick if just a couple of spots high. 17 Tyler Zeller A 12 7 57.60% Very similar to Henson - only negative is a senior bound for the NBA should have a higher Value Add, but Usage and Def. Rebounding predict strong starter. 18 Terrence Jones A C- 9 56.30% Almost sure strong starter within a few years. His Value Add and defensive rebounding is average, but every other physical and statistical measure predicts a great NBA player. 19 Andrew Nicholson C- 22 24 44.80% Can be a strong rebounder off the bench, but a senior playing against lower competition with his numbers is just a notch below and NBA starter, and they could have done a little better with the 19th choice. 20 Evan Fournier NA 30 54 23.00% We haven't calibrated European stats yet, so can't pass judgment either way. 22 Fab Melo C 25 27 41.30% You can't draft size, but on every other indicator Melo looks like just a good NBA reserve. So little data though with part of one season, he could surprise. 23 John Jenkins D 31 36 32.80% Again high vertical seems to put someone ahead of where he projects - but otherwise really looks borderline to even be in a rotation. 24 Jared Cunningham C- 34 33 34.10% Steals are so off the charts that you can't dismiss this pick, even though overall this looks a few spots too high. Obviously teams are filling roles now, and Cavs may need some pressure defense. 25 Tony Wroten D 27 45 26.80% Looks like a longshot overall, but again it's a verticle/speed guy with a ton of steals in this case, so those three seem to have been weighted the most heavily by teams this year. 26 Miles Plumlee B 37 22 46.60% Vertical, strength, agility, great speed for a center, physically unreal and domaint rebounding - he is at least a very strong backup within a few years and they might even have a starter at the 26th pick - which doesn't usually happen. 27 Arnett Moultrie A 19 21 49.10% Again, speed and vertical (87th percentile and 88th percentile), but in this case he is a dominant rebounder with wingspan who is a borderline starter. Clearly the best available - surprised they traded him to 76ers. 28 Perry Jones C 17 26 41.40% He was viewed as slipping from what the public thought, but this is only one spot behind where we project him. Speed and vertical at 92nd percentile for a big guy and 90th percentage in steals. 29 Marquis Teague C 23 40 31.10% Again, picked higher than how well we project he will perform, but with 98th percentile in vertical and 93rd percentile in speed you can see the appeal. With that potential for a freshman on a team with 6 NBA guys, hard to say a PG pick here isn't solid. 30 Festus Ezeli C 32 44 27.10% A little high - doesn't project to be in a rotation, but as strong and long as he is and being out injured this year common sense says a decent pick. Grade – this is the Grade the TEAM gets for the pick, not the player. If the 30th best player is picked 5th, the team will get an “F” because they had much better options. If that same player were picked 55th, the team would get an “A” because they identified a steal who will likely produce many more wins than a normal 55th pick. If the Hornets picked someone else they would obviously get an “F” for the pick since Davis projects as competing for the top draft option since our system tracks back to 2006. 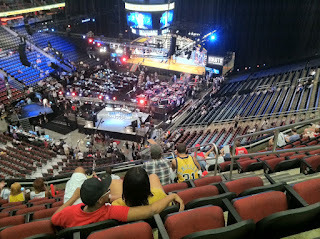 Mock – we averaged 11 mock drafts together, and this was where the public thought the pick would go. 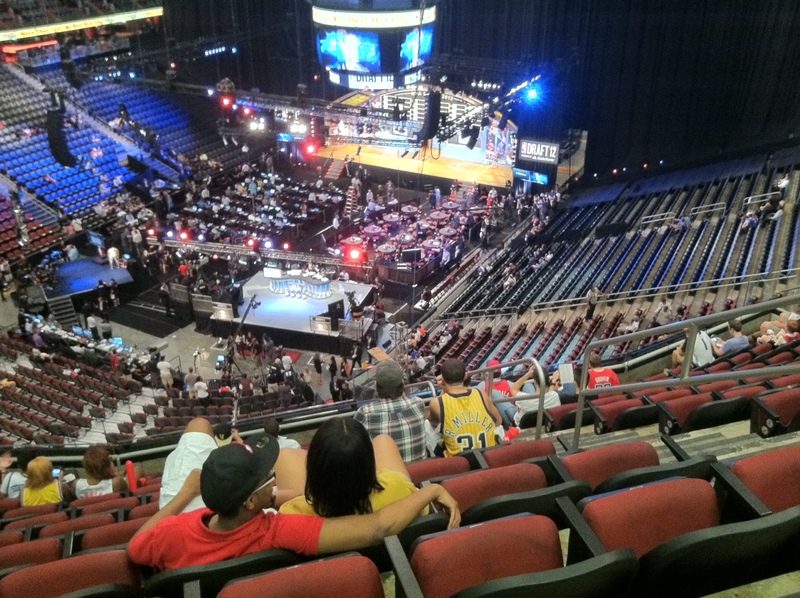 Our projection – Keep in mind we have built a model that projects how GOOD a player is going to be in the NBA, not where we believe a team will draft him. If we were calculating that, we would base it more on points per game and players on NCAA champions, since things like that lead teams to draft players too high. If we project a player as #9, that means he projects to be the 9th best NBA player of this group within a few years – not that we actually expect him to go 9th in the draft. Win% - this is the percent of games a team would win if all of their players were as good as this player will be within the next few years. A 50% player projects to start within a few years for a sub-.500 team and be a strong reserve for a team over .500. A 50% is equal to a .100 Position Adjusted Wins for those of you used to that figure. The last couple of months have been tough for us, because we love to calculate and write. We have built a statistical model that has been accurate at predicting how many wins a player will create for his NBA team based on his college stats, what year he was in school, and his physical combines.